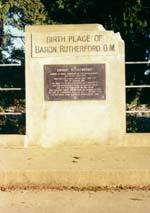 The Rutherford Birthplace is alongside State Highway 6, at Brightwater some 20km from Nelson towards the West Coast. Location map. Ernest Rutherford is this country's most famous son, Nelson's most gifted export, one of the most illustrious scientists the world has seen and the first New Zealander to have been awarded the Nobel Prize in Chemistry. His work has ensured his immortality and so we should be using him to stimulate the children of New Zealand. We need to tell them that he had no more opportunity than they had, yet by hard work he achieved world fame. New Zealand needs such role models if it is to prosper. Rutherford died just before the Second World War so it was 1953 before an international effort, co-ordinated by the Royal Society of London, was mounted to honour him. This raised the money for Rutherford Scholarships and for touring Rutherford lecturers. To open the appeal in New Zealand his birthplace at Brightwater was marked. A bronze plaque mounted on a concrete slab on the roadside was a nation's monument to the birthplace of its most famous son. Some time thereafter a truck knocked one corner off. All in all, it looked as if no one cared. The house that once had stood on the site, and in which Ernest Rutherford had been born, had been demolished around 1921. In the 1960s overseas visitors trecking to Nelson, on a pilgrimage to the birthplace of their hero, were taken into the countryside and shown a pig sty - quite literally. The site was the back yard of the house next door. In 1971, the centennial of his birth, Professor Peter Fowler FRS, Rutherford's eldest grandchild, was appointed the Rutherford Lecturer to New Zealand. This initiated the first ever get together in Hamilton of the New Zealand Rutherford relatives. They were so distressed about Peter's report concerning the poor state of the Birthplace they raised money to assist the small local council to purchase the site in order to preserve it. 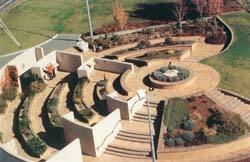 The Waimea District Council has since been amalgamated into the Tasman District Council. The site was then all but forgotten about. It seems the only person raising the matter and keeping the dream alive was Frank Allan: the retired physics master from Nelson College, the mainstay of the Nelson College Old Boys Association and a Nelson identity. Over the intervening years two or three public meetings were called to decide what to do with the site. Several suggestions were from artists who thought the site worthy of their creation. These included such suggestions as a large tower surmounted by a neon sign model of electrons orbiting an atom. The one common feature of these meetings was that no one offered any money. The Waimea County Council thought some display panels would be appropriate. They had the adjacent landowner gift a two metre strip on the Nelson side of the section to enlargen the site so that a bus could pull off the road onto the site. In 1987, at dawn on the 50th anniversary of Ern's death, I visited the site. It was still a wasteland and a national disgrace. In the field behind a cow raised its tail and spoke for me. The Rutherford Birthplace Project consisted of myself as convenor, Ross Moore, the Executive Officer of the Royal Society of New Zealand and Ken Shirley, the local Member of Parliament. We offered to raise the money and do the job. Sissons and Conway of Nelson prepared a landscape design to our brief. Baric Design (now Heritage Communications - www.heritagecommunications.co.nz) of Nelson prepared the display panels from information I supplied. Four hundred and fifty thousand dollars later the nation had something it could be proud of. The Rutherford Birthplace has been transformed into a tranquil haven where the story of his life and work is told using fourteen display panels and six sound stations in a garden setting. It is floodlit and open all hours, a little bit of science on our landscape. It was opened on the 6th of December 1991 by Sir Mark Oliphant and the Governor-General of New Zealand, Dame Cath Tizard, in the presence of all of Rutherford's grand-children. A mound is surmounted by a small bronze statue of a child - a New Zealand child stepping out into the future. (Note the catapault showing from one pocket). A dairy farm behind preserves Rutherford's rural background. General view Descent off the mound is via a series of garden terraces and six bays in which are the display panels and sound stations. The school teachers who influenced young Ern are featured on the appropriate panel. The flora looks good. I find that visitors often spend as much time examining the plants as they do the display panels. Tree clusters in three of the corners represent the countries which gained through his fame - the totara of New Zealand, the maple of Canada and the oak of England. The front wall is of Nelson marble to showcase a local product. The Tasman District Council, assisted by the Nelson City Council, have since purchased the house next door and have merged that section in as a picnic area. The Tasman District Council maintain the Rutherford Birthplace as a treasured reserve and has given the Minister of Tourism written assurance that they will continue to maintain it to international tourism standards. A group of locals, the Friends of the Rutherford Birthplace, roster themselves to keep a daily eye on the site. A national group, The Guardians of the Rutherford Birthplace, is in place ready to be activated whenever future changes are proposed at or near the site. Some 40 Seeding Patrons allowed the work to be initiated but it was the 16 Principal Patrons, those contributing $20,000 or more, who ensured the success of the project. If you can return the favour and support them then please do so. Science owes them a round of applause. To view more pictures of Rutherford's Birthplace and the Opening click here.